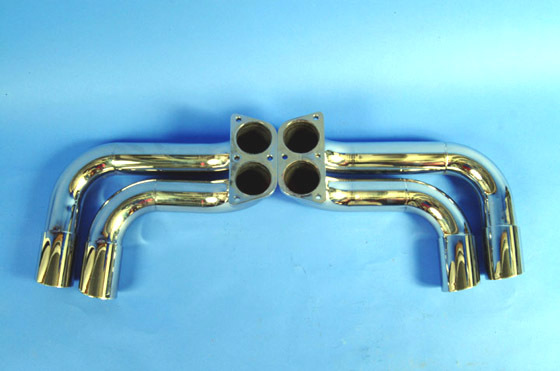 We build many different custom stainless steel exhaust systems. This photo shows a Ferrari 355 aftermarket stainless steel headers built with 321 stainless steel U bends. We C.NC. machined round to oval stainless steel exhaust flanges. All joints T.I.G. 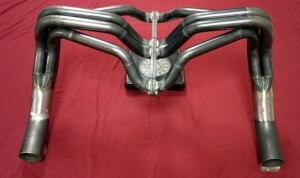 welded with argon back gassing. These Pro Stock Chrysler Hemi stainless steel headers were built with Burns stainless steel U bends and Burns stainless steel merge collectors. All joints are T.I.G. welded using argon back gassing. 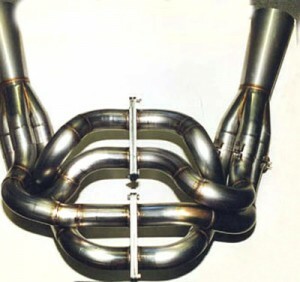 This is one of our complete custom stainless steel exhaust systems. 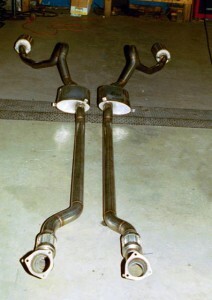 Pro touring 2.5 inch stainless steel exhaust system built for a Pro touring 1967 Pontiac Catalina. The headers are connected to the stainless steel exhaust system with stainless steel flex joints. We built custom stainless steel resonators with replaceable stainless steel tail pipe tips. This is the first of many complete custom stainless steel exhaust systems I built. We built this Ferrari 512 B. B. replacement stainless steel exhaust system while employed at a now defunct company. 1.75 o.d. .049 wall thickness 321 stainless steel tubing was used to build the model and the production systems. 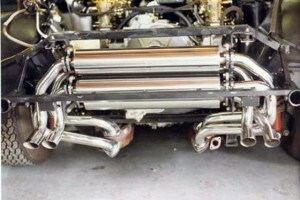 The exhaust system bending fixtures are also used to assemble the production systems. 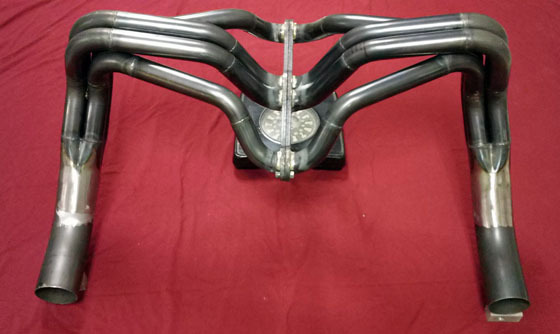 We built these Pro Stock Olds stainless steel headers using the customers old headers as a model for our universal header fixture. We T.I.G. weld all Joints. We back gas the tubes with argon using an independent tank and regulator. The masking tape between our C.N.C. machined stainless steel header flanges is used to seal the ports while welding. 1978-80 While working for a now defunct company I designed and or built this entire Prototype Ferrari 308 Turbocharger System. The Turbocharger intake manifold, carburetor manifold and the air cleaner were designed by Doug @Flo Design. 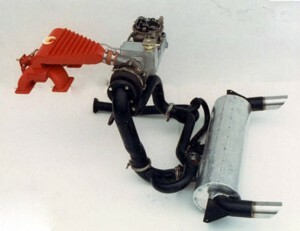 I built or coordinated the production, manufacture of this entire 308 Ferrari Turbocharger System. 1976 Our Twin Turbo Big Block Chevy exhaust system was built for a one off Hydro stream jet boat. I think we used standard boat headers. 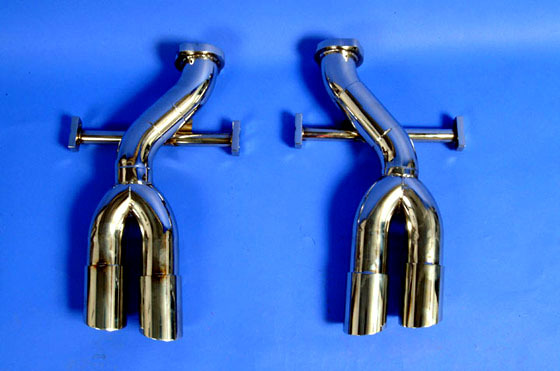 We cut off the stock collectors and made new collectors to match the turbochargers. 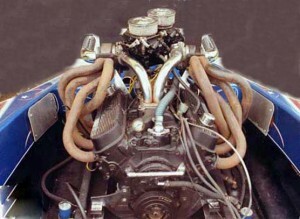 Twin 750 C.F.M carburetors are mounted on a common Intake manifold. We build Ferrari 360 Stainless Steel Aftermarket Tail Pipes. We use 2.5 inch O.D. .065 thick 304 stainless steel tubing. Our C.N.C Machined Stainless Steel Flanges are exactly the same as the original Flanges. We Back Gas the tubes with argon using an independent tank and Regulator. We manufacture our Tail Pipe Tips using 2.75 O.D.1/8 wall Stainless Tubing. 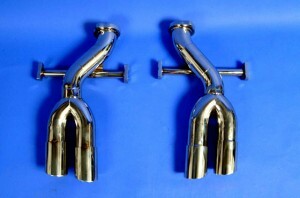 We build Ferrari 550 Stainless Steel Aftermarket Tail Pipes. We use 2.5 inch O.D. .060 thick 304 stainless steel tubing. Our C.N.C Machined Stainless Steel Flanges are the exact same size as the original Flanges. 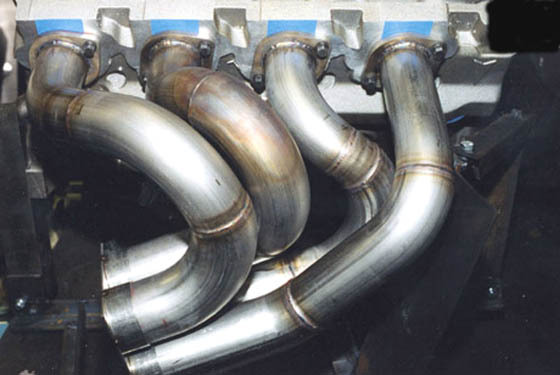 We manufacture our Tail Pipe Tips using 2.75 O.D.1/8 wall Stainless Tubing. We Back Gas the tubes with argon using an independent tank and Regulator. 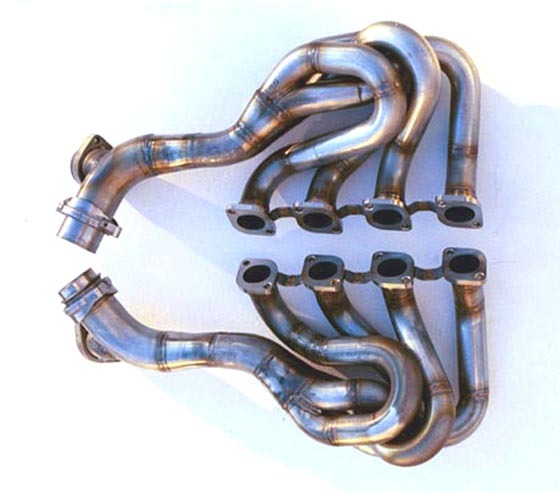 Our Cheetah Kit Car Small Block Chevy Headers and side pipes closely follow the original design Cheetah Headers. We built this system using mild steel tubing. The primary tubes on the original headers are angled differently because the engine is set back further then this car.